OSIRIS-REx is driven by the top-level science objective to return >60 g of pristine, carbonaceous regolith from asteroid Bennu. 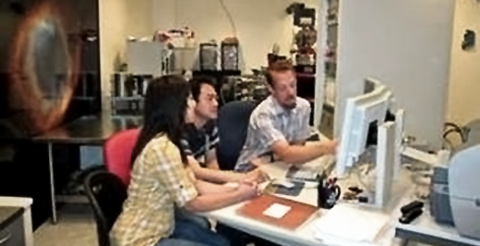 In support of this objective, OSIRIS-REx has a team of sample scientists, based at Johnson Space Center (JSC), who are capable of analyzing material down to the atomic level. They are anxiously awaiting their chance to apply an awesome array of instruments to understand the composition and structure of the returned sample. In the meantime, they are deploying these tools to ensure that the returned sample remains pristine. Read on to find out how we get this job done. Regolith is the blanket of rock that covers the asteroid surface. We believe that the rocks on Bennu are rich in carbon and organic compounds and are related to the CI or CM carbonaceous chondrite meteorites. In addition, we think they contain clay minerals, which contain water in their crystal structure. We are interested in carbonaceous material because it will provide insight into the earliest organic molecular evolution in the Solar System and the origin of life. We are interested in the clay minerals because similar material may have formed our oceans. Our key challenge is to make sure that the molecules and minerals that we study actually came from Bennu, and were not introduced by us as terrestrial contamination. 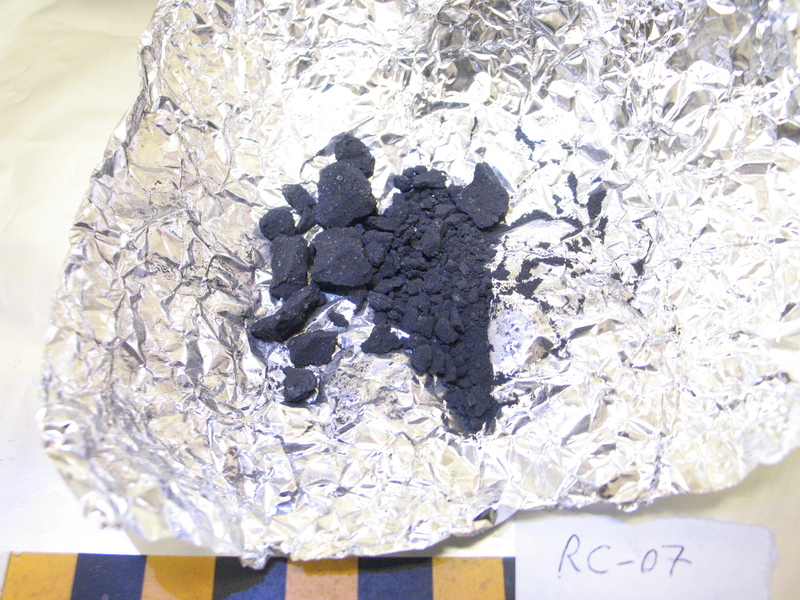 The surface of Bennu may resemble a carbonaceous chondrite meteorite like the Tagish Lake sample shown here. Our first job was to define the word pristine. According to Webster – pristine is defined as being “in perfect condition : completely clean, fresh, neat, etc. : not changed by people : left in its natural state”. Unfortunately, the reality of building a spacecraft means that we cannot realistically meet this ideal definition. Instead, we had to take a more pragmatic approach – we define a “pristine sample” to mean that no foreign material introduced into the sample hampers ours scientific analysis. Basically, we know that some contamination will take place – we just have to document it so that we can subtract it from our analysis of the returned sample. The first part of the job is to keep the spacecraft clean during assembly and test. In order for the Spacecraft Contamination Engineer to do her job, she needed cleanliness defined in engineering terms. Spacecraft cleanliness is specified by two parameters: particle count and thin-film depth. The Science Team defined cleanliness in terms of key chemical elements and organic compounds of interest. We had to find a way to translate between these two communities. The Science Team decided to focus on a key set of elements for contamination control. Out of the 98 naturally occurring elements, we picked six elements of key interest: Carbon (C), Potassium (K), Nickel (Ni), Tin (Sn), Neodymium (Nd), and Lead (Pb). These elements were chosen for scientific reasons. Carbon represents organic material; potassium represents common rock-forming minerals; nickel represents common meteorite metals; tin is a common industrial contaminant; neodymium represents important trace elements; and lead is central to uranium-lead age dating – the prime technique for measuring the absolute age of the sample. In addition, we picked one class of organic compound, amino acids, for monitoring spacecraft organic cleanliness. It seemed like science had done a great job specifying their cleanliness needs. However, the Spacecraft Contamination Engineer did not have procedures for measuring each of these elements – the science was understood but we still had to convert it to engineering language. OSIRIS-REx CSI focuses on six-key elements as evidence of contamination events. Engineering contamination requirements specify cleanliness in terms of particle counts and thin-films residues – not elemental and organic abundances. After initial discussions with our Contamination Engineers, we agreed that known, albeit challenging, particle and thin-film contamination levels were acceptable on TAGSAM and the Sample Return Capsule. These levels can be achieved using established cleaning procedures – meaning we could go forward and design our assembly facility and test program. To make sure that the engineering definitions met our science requirements, we had to do some calculations. When we meet our contamination requirements we can expect to leave behind about 2 particles larger than 5 microns in diameter and an additional 500 nanograms of thin-film residue on a standard surface. 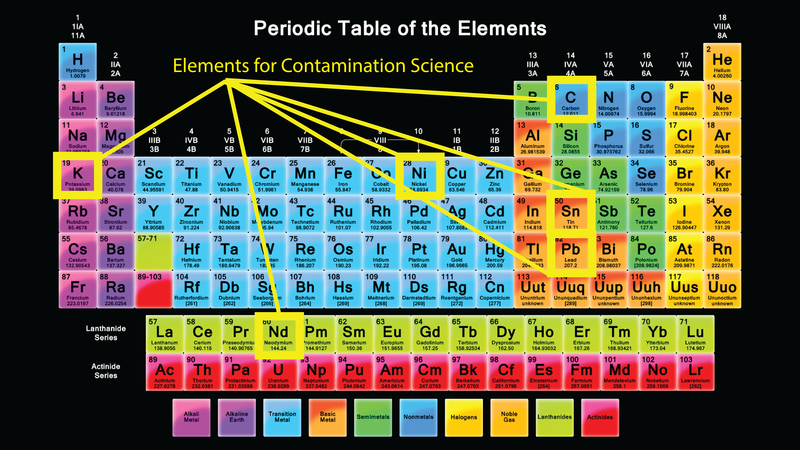 In a worst-case scenario, if all contamination were pure tin, neodymium, or lead, then these elements would be contaminated beyond acceptable science limits. However, we decided that such compositions are higher unlikely. Nevertheless, we will be watching out for this kind of event as part of our Contamination Knowledge effort. Contamination particles will be smaller than the width of a human-hair. Once we agreed on the cleanliness of our flight hardware, we designed a Contamination Knowledge program to monitor the contamination that occurred and document it for scientific purposes. As TAGSAM and the Sample Return Capsule are constructed, the Science Team will deploy Ground Contamination Monitoring Plates throughout the Lockheed Martin facility. Exposed monitoring plates will be hand-carried to JSC for archiving and examination every 2 months. A subset of the monitoring plates will be examined within 1 week after transfer to JSC by optical microscopy and secondary electron microscopy to identify non-volatile residues, particle densities and size distributions, and major-element compositions of contaminants. The secondary electron microscope permits us to produce high quality x-ray maps of planetary samples in reasonable times. In the example shown below, an x-ray map of a portion of a chondritic meteorite, Mg is red, Ca is green, and S is blue. 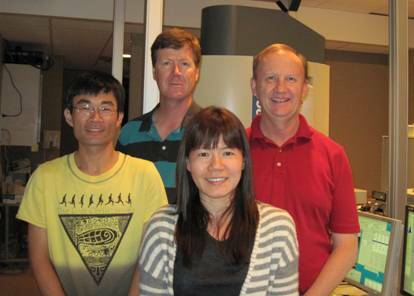 Scanning Electron Microscopy provides chemical maps of particles to quickly identify them. After we scan the plates using the electron microscope, we will select some particles to be examined using infrared spectroscopy. This technique allows us to measure major minerals and organic molecules in a non-destructive manner. We will then take this information and use it to classify particles into different groups. Electron microscope and infrared spectroscopy will provide a basic level of information on the composition of our contaminants. These techniques serve as a rapid and inexpensive triage to screen the samples. However, if some kind of anomaly in composition is encountered, then the grain will be examined in greater detail. Particle types that will be given top priority for in-depth study include: (1) Particles high in the key elements C, K, Ni, Sn, Nd, and Pb, (2) Carbonaceous grains, and (3) Abundant unexpected particles that have distinct chemical traits. The Contamination Science Investigators have access to a variety of analytical instruments for more advanced study. These include Transmission Electron Microscopy (TEM), Electron Microprobe Analysis (EMP), Laser Ablation Inductively Coupled Plasma Mass Spectrometry (LA-ICPMS), and Chromatography-Mass Spectrometry. All of these facilities can be used to determine the elemental abundance and other properties of the contamination particles. These studies will provide considerably improved knowledge about particle composition and will help us identify the guilty party. Once we know the contamination source, we can go back to our spacecraft facility to see if we can change our process and prevent additional contamination. The result of all this hard work will be a pristine sample of asteroid Bennu. We will know all of the terrestrial compounds that may have been introduced to the sample. This knowledge will allow us to easily see through this layer of misinformation and uncover the real secrets of the Solar System that are hidden within. I toured this facility last September. We were also lucky enough to visit the Stardust, Genesis, and moon rock labs. Cool stuff!! Reblogged this on Astromaterials Research and Exploration Science Directorate.